As a photographer, Iceland has always appealed, not just because of the famous Northern Lights but the country’s beautiful natural landscape. The holiday had been a long time coming, and was booked 6 months prior as my 10th wedding anniversary to my wife. 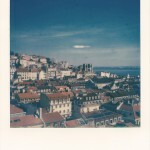 We had done city breaks and hot countries before but we wanted something completely different, out of this world almost. Iceland, with its famous scenery and the Northern Lights was ideal. 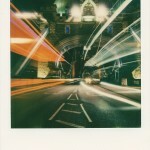 Firstly, I had to decide whether to take the SLR680 or the Spectra Pro. Already aware that the film would suffer under such cold conditions, and given it was November, I knew there would be limited light to play with, averaging only 5-6 hours of sunlight. For timed exposures, the Spectra would come into it’s own compared to the SLR680 and I felt the wider format would suit landscapes. In the end I took both cameras, along with 5 packs of film. As soon as we landed on our first day, the sun was already dawning around 3pm. By the time we reached Reykjavik, it was more or less dark, a common theme for our next few days, only seeing the city in the dark. Reykjavik is a small city in comparison to other cities, town like in fact. Even though most of the population resided in the city, it felt strangely quiet. 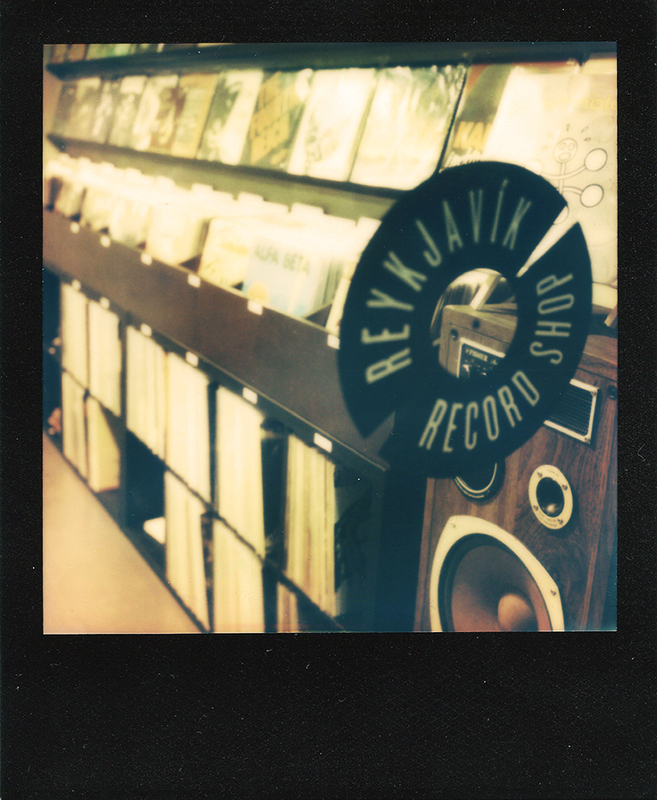 I knew there would be a couple of distinguished landmarks in Reykjavik that I wanted on Polaroid, having read the guidebooks. 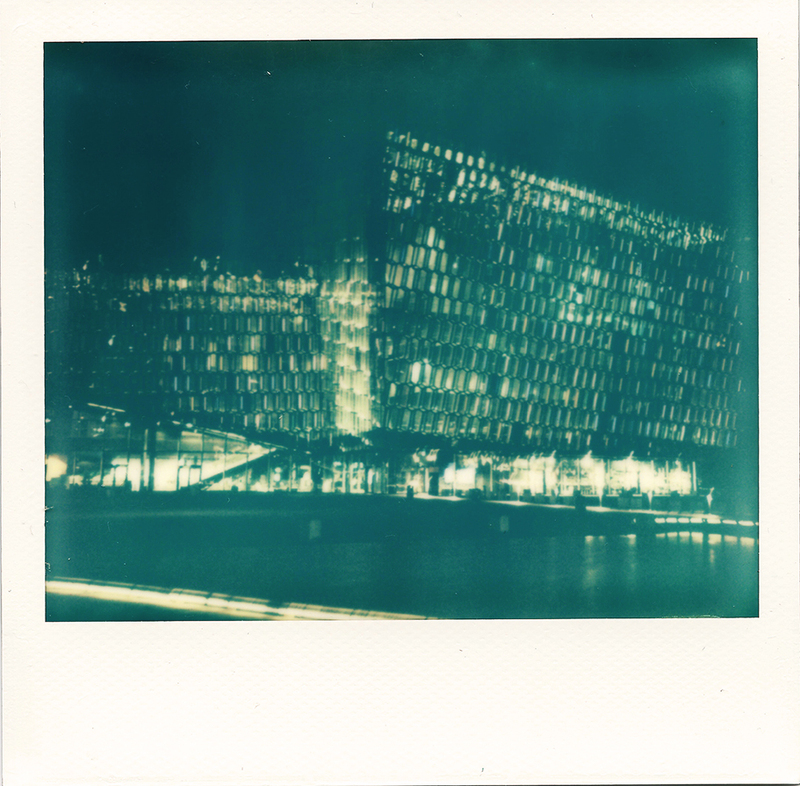 One was the Harpa Concert Hall, a shot definitely more beautiful at night due to its colour light reflections. Eerily quiet, and equipped with my DSLR and Manfrotto compact tripod, I tested the shot on digital first, matching the DSLR to ISO640 and F10 mirroring the specifications of the Spectra Pro, then playing around with how long to keep the shutter open for. 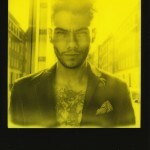 Using this method, I could then get the Spectra Pro set to roughly the same settings and take the same shot on Polaroid. At least that was the theory. 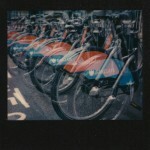 I wanted my polaroid shot to come out more colourful, but it came out pretty cool (by that I mean in terms of warmth), and there began my battle with keeping my film developing warm enough, during the rest of my holiday. In England, we have certain days where we will see sun, then rain, then winds, and even hail stones/snow. 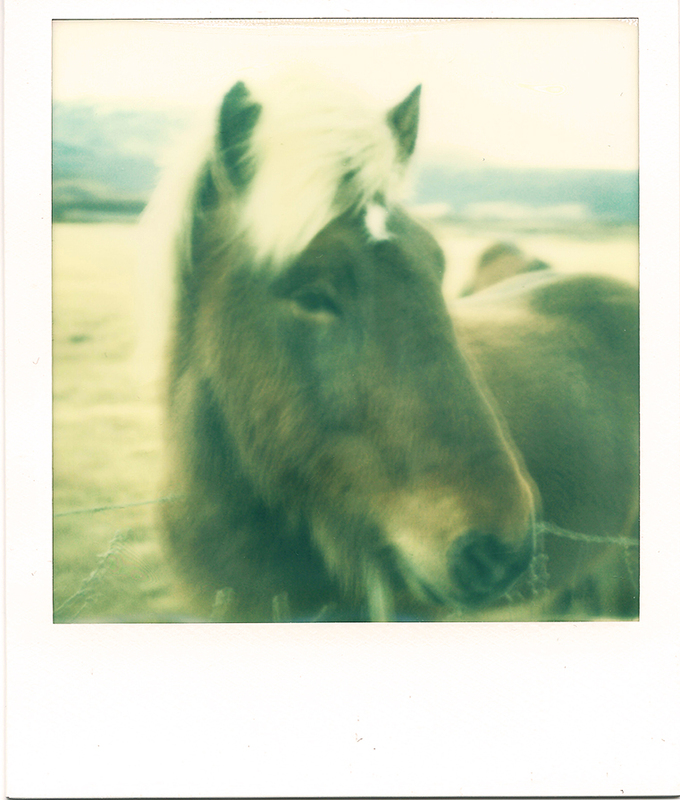 In Iceland, you pretty get that everyday, a few times over. Given the unpredictability in weather, I thought it was best not to risk hiring a car on my first visit, instead opting for 2 small bus tours during our time there. One was to obligatory Golden Circle and the other to the South Shore of Iceland. With our time at each destination limited, and I was constantly juggling between shooting on my DSLR and Polaroid cameras, and sometimes my smartphone (when it’s raining, the smartphone’s small lens rescues shot you can not take with a SLR with a big lens). Aside from the coldness, I was also fighting against the lack of light. My first couple of Polaroid shots in the morning were blurred due to the lack of light. Given it was landscapes I photographing, the flash would not have helped. Short of setting up a tripod to take the shot, I would have to wait for light. Arriving at Gullfoss, the famous ‘Golden Falls’, most people had the idea of bringing out their tripod to take the almost clichéd shot of the water flowing, myself included. What none of us realised was, given the winds and the coldness, along with the force that the waterfall produced, we were all fighting not to be blown back by the G Force. Open your mouth and you could barely shut it, with your face wobbling, slapped by the bitter cold wind. Most people retreated to the café above Gulfoss, but I was adamant to fight against the elements and get my ‘tourist’ shot. 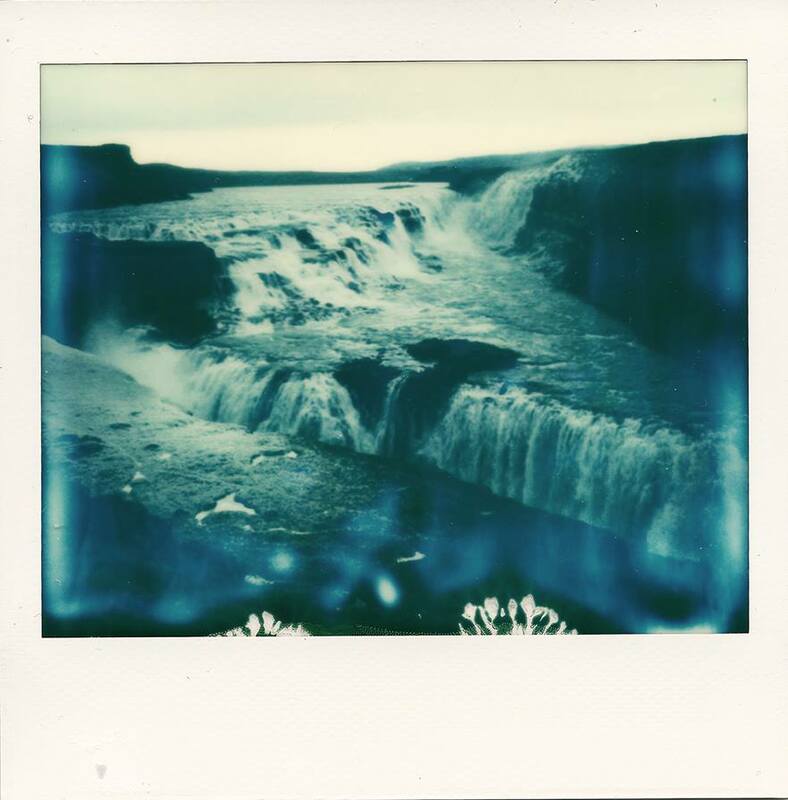 I gave up taking the shot of Gullfoss with my DSLR, water kept on hitting the lens but had more success with my smartphone and my Spectra. I kept on having the cold film issue at the back of mind. Although I kept the camera warm in my rucksack, the problem was still keeping it warm whilst developing. I used my body warmth to help the film develop, but it would still come out relatively cool. Thankfully I had a little more light to play with. My next shot at Strokkur Geysir had me with my Spectra waiting to click the shutter at the right moment when the water spouted out. I timed it right, but almost lost this shot, having dropped it on the tour bus at the end of the day. Luckily a couple on the tour also turned up on our tour the next day (more on this later). 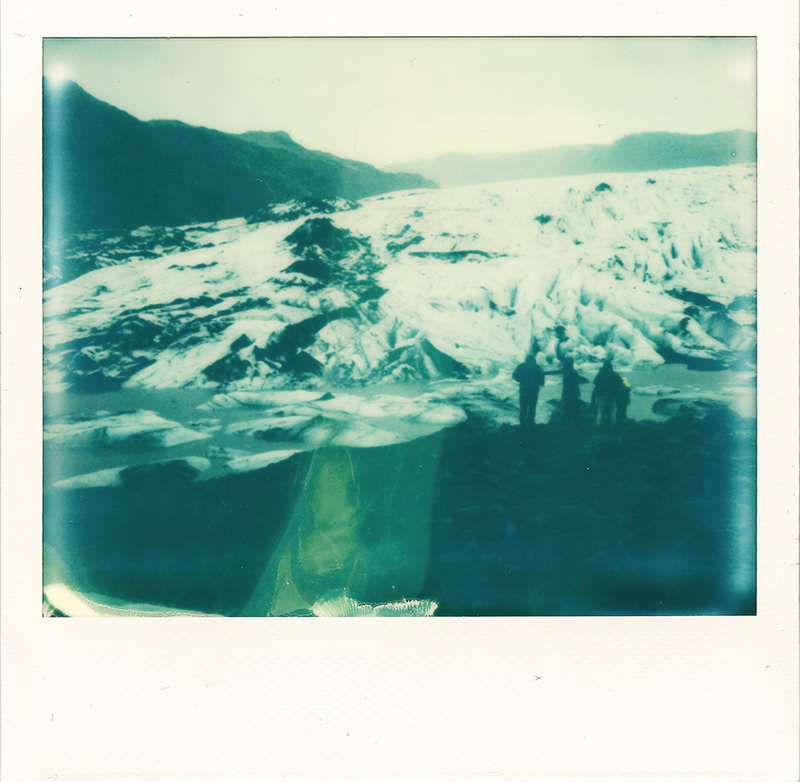 The light started to go down when we were at the last stop of the Golden Circle, Thingveller National Park and a few more Polaroids came out blurry. 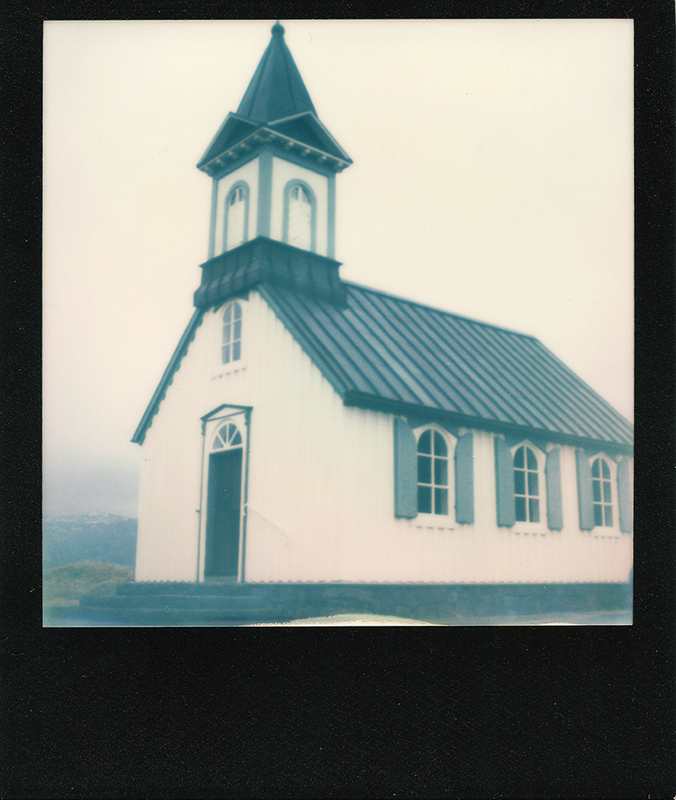 The only picture that came out any good was the picture of the church next to the Icelandic’s President retreat at the national park. It was our second night in the Iceland, but once again the small bus tour operator said that cloud coverage meant that the chances of seeing the Northern Lights were slim. We could have gone with a larger bus company, but we had been told that the experience left a lot to be desired and the just carted people out to the pitch black wilderness regardless of the chance of seeing the lights. We settled on a nice evening meal but I took my tripod out with me. If I wanted any Polaroids of Reyjkjavik, it would be in the dark, so a steady tripod came in handy. The following day was the less obvious tour of the South Shore. It was a smaller group but we spotted 2 couples we met the previous day. The scenery on the South Shore was something to behold, and to me showed more of the natural beauty of Iceland. More importantly, it was our 10th year anniversary on this day, and what a breath taking way it was to spend it. We had already seen 2 waterfalls the previous day, so to start off with another waterfall, Seljalandsfoss, was a little underwhelming, although every single one had its charm, this one you could walk underneath and behind it. The heavens then opened and it was raining quite heavy, and we had a choice between the black sand beaches at Vik or the seeing the glacier at Mýrdalsjökull. The driver opted for the glacier. Off the ring road, we entered a baron landscape and roads made totally of black sand/gravel, one that I am sure I had seen in many films before (such as the alien planet in Prometheus). However, that was nothing compared to get out and doing a 10 minute all wrapped up to combat the heavy rain and wind, towards the glacier. As we got closer, I truly felt I was standing on the shoulder of giants and how small we were compared to the landscape. It was a thing of absolute beauty seeing the glacier in all its glory, even in the turgid weather conditions. 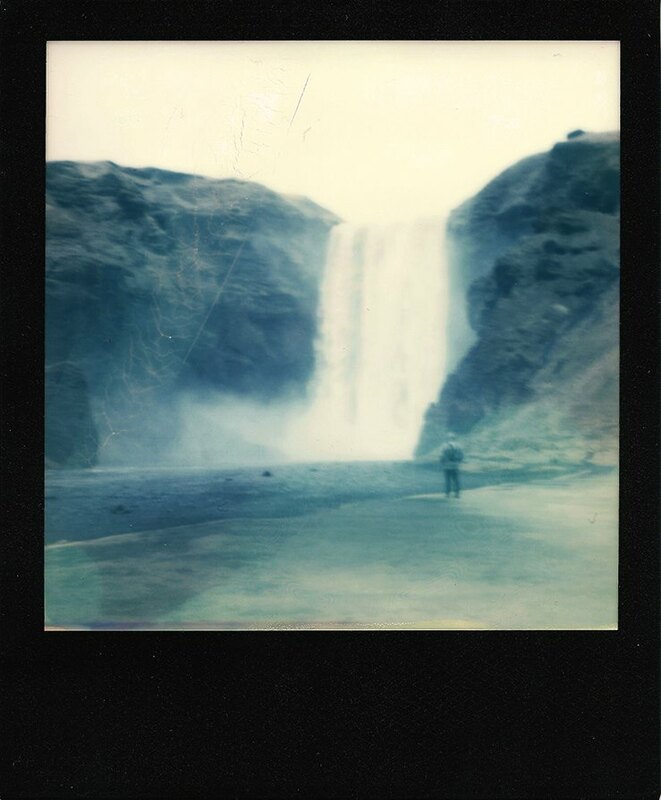 I could not take a good shot with my DSLR, but I used the opportunity to take what I consider my favourite Polaroid shots of the whole trip, using my fellow tour mates as subjects standing staring at the vast wilderness. 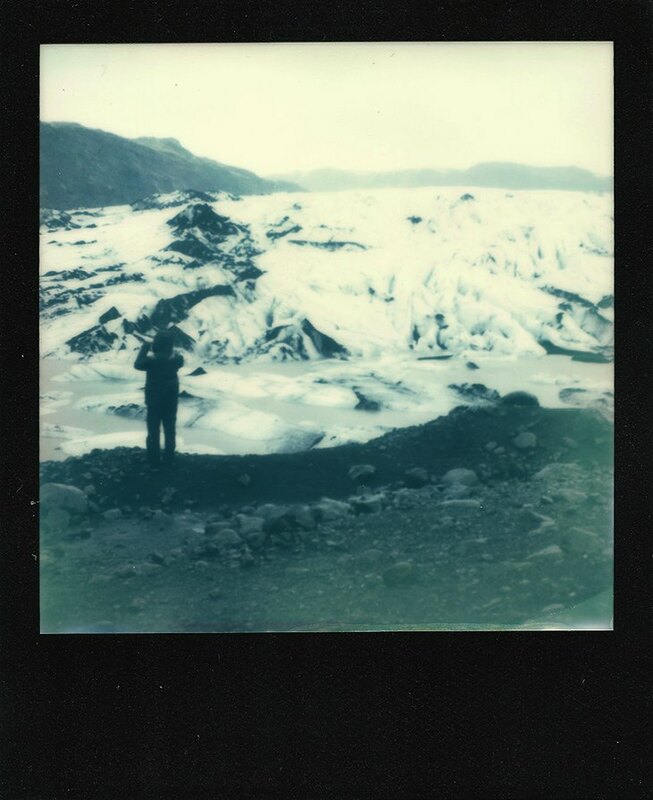 I didn’t want to leave, I would have quite happily sat there and steered for a few more hours and walk on the glacier. 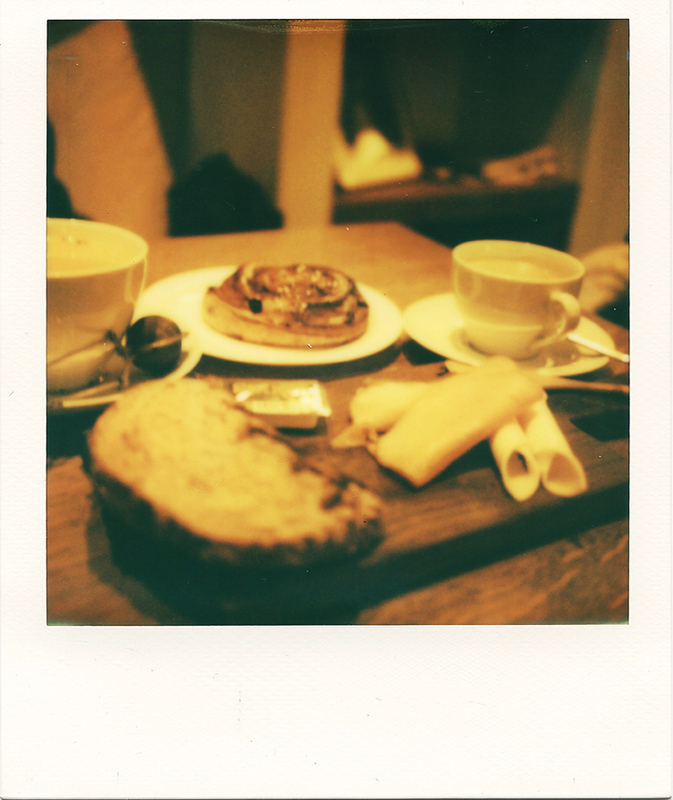 It was when we sat down for lunch at a café that the tour mates all got chatting and inevitably having seen me bringing out my Polaroid cameras the previous day, the conversation turned to the resurgence of Polaroid and the story of the film production all came spilling from my mouth. At that moment, I realised that Polaroid itself had transcended the age gaps that were between the 3 couples. 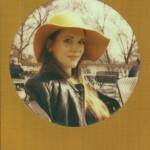 The older couple said they hadn’t seen a Polaroid camera in years, whilst the younger couple were in awe of the retro-ness and instant nature of the photos. 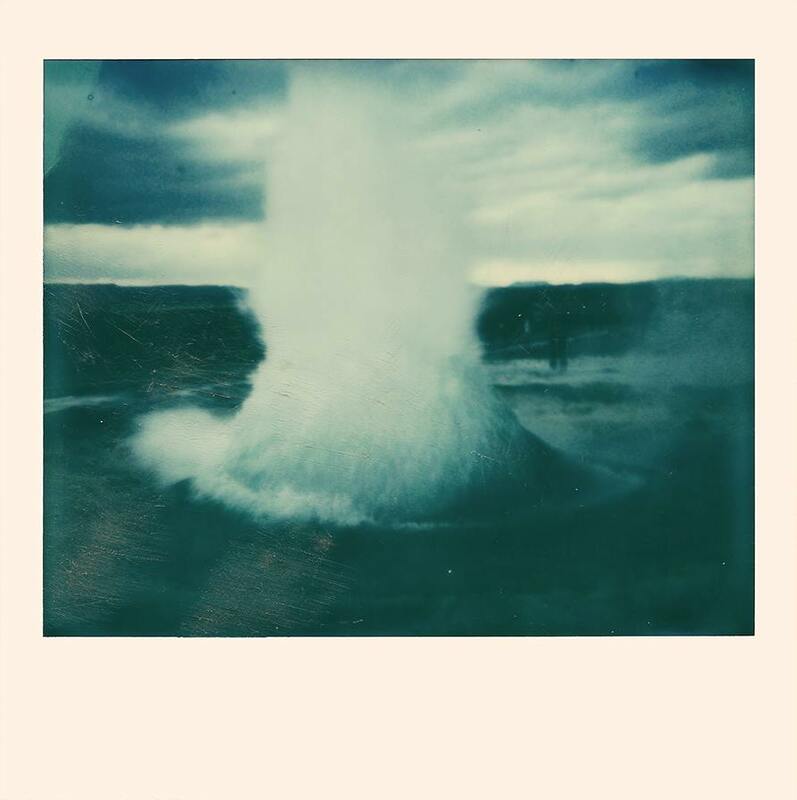 Due to this conversation one of the couples said they had picked up my shot of Strokkur on the floor of the tour bus the previous day, and I was ecstatic that one of my favourite shots from our trip had been saved (even though it was a little bit scuffed). I gifted the couple a Polaroid whilst they were on Vik beach much to their excitement. The beaches at Vik were surreal, the black sand along with rock formations caused by magma from previous volcanic eruptions, made it feel gothic, and almost evil. 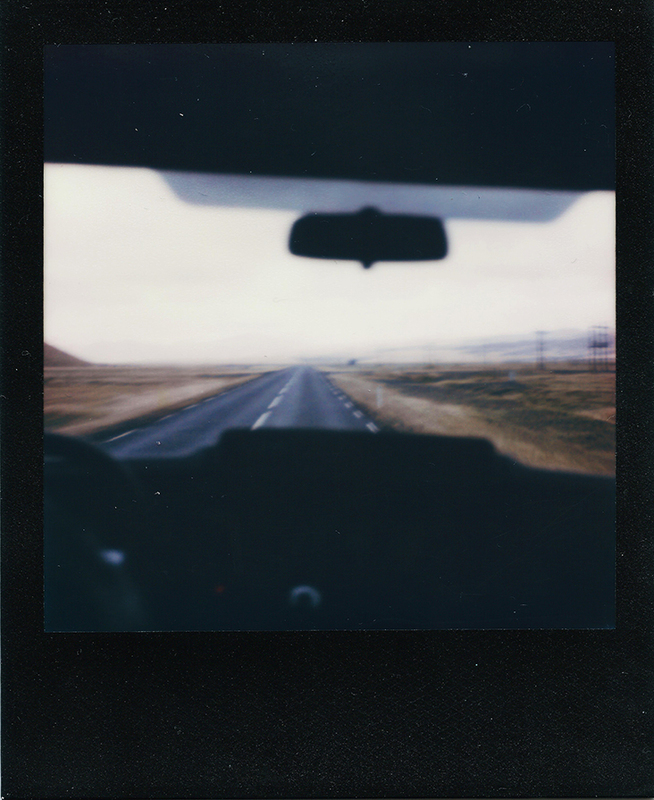 One has to be mindful with this much darkness (the ground and the mountains) and the limited light, be careful of composing your polaroid. 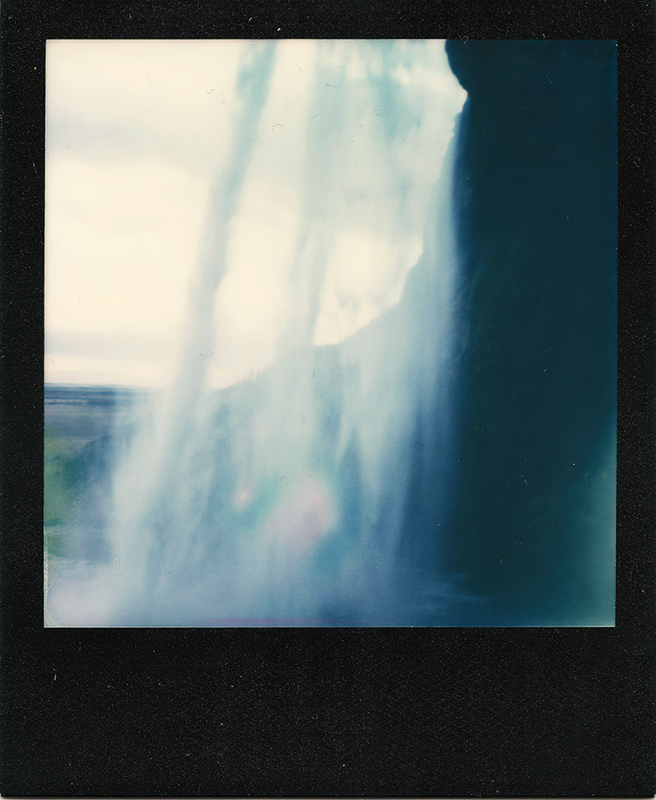 We visited one last waterfall at Seljalandsfoss. Even though I had visited quite a few waterfalls in the couple of days, to me every one had its charm and once you are there in person, its hard not feel in love. Arriving back in Reykjavik, pretty much exhausted from the tour, it was last chance to get on a tour for the Northern Lights, but alas, it was not to be. They always said that seeing them is not guaranteed, and it was certainly true in our case, although we have made plans to return as we both love the island so much. The next morning we relaxed in the Blue Lagoon, on our way to the airport before heading back home. If you do go to Iceland, go for no shorter than 5 days, a week or 2 if you can spare it. We went for 4 days and it flew by, and I felt we only visited a fraction of the wonderfully scenic country. 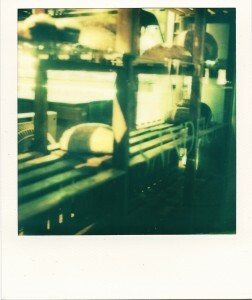 As for Polaroids, I would advise in taking a cold clip to help film develop in the warmth, putting next to your own body heat. Certainly be prepared for a few failures, and expect the infamous snow flakes in the film due to the coldness. 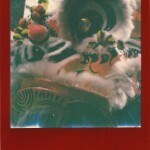 © 2019 Polaroids by Ray Liu. Theme by Anders Norén.